What are your current, most-pressing business and marketing challenges? Improving email marketing or ecommerce conversion? More effective lead nurturing? Higher margins? More sales? Employee recruitment and retainment? From our research, we’ve discovered that many of these surface-level problems and opportunities have a much deeper cause — lack of a well-defined, forceful value proposition. Most companies inherently have value propositions, but they are being held back because they can’t quite articulate them across all their marketing and sales channels, to all their employees, and with all of their key vendors and partners. The MECLABS value proposition workshop is a two-day workshop designed to put a powerful value proposition into the hands of your executives and your team by facilitating a deep dive into your possible value claims. Your team will participate in an in-person team training and workshop on site at your location or at our facility in Jacksonville, Florida. Then, using the insights extracted from your core team, our researchers will apply MECLABS Institute’s rigorous methodology to craft a powerful value proposition statement with evidentials, and provide very precise recommendations of how to apply this new value proposition to your communications to increase conversion rates throughout your funnel. This analysis often results in a fundamental transformation of how companies go to market, interact with customers and view themselves in the marketplace. The business leader gets a clear, consistent and forceful underpinning for all future messaging from their team and their agency partners. In addition, value proposition workshops often uncover new ideas for transforming business strategy and improving product or service delivery to increase market share. The marketing manager and the advertising agency are empowered to attract and retain customers who can underpin all future marketing communications — from ads to emails to landing pages. Here’s an example of how one organization used the knowledge gained from a Value Proposition Workshop to greatly increase attendance for their global event. Background: Willow Creek Association is a nonprofit organization committed to transforming leaders in their respective communities. Each year, they host a two-day event (Global Leadership Summit) to provide those leaders with training from speakers in successful companies. Primary Research Question: How can we create more value to increase conversions? 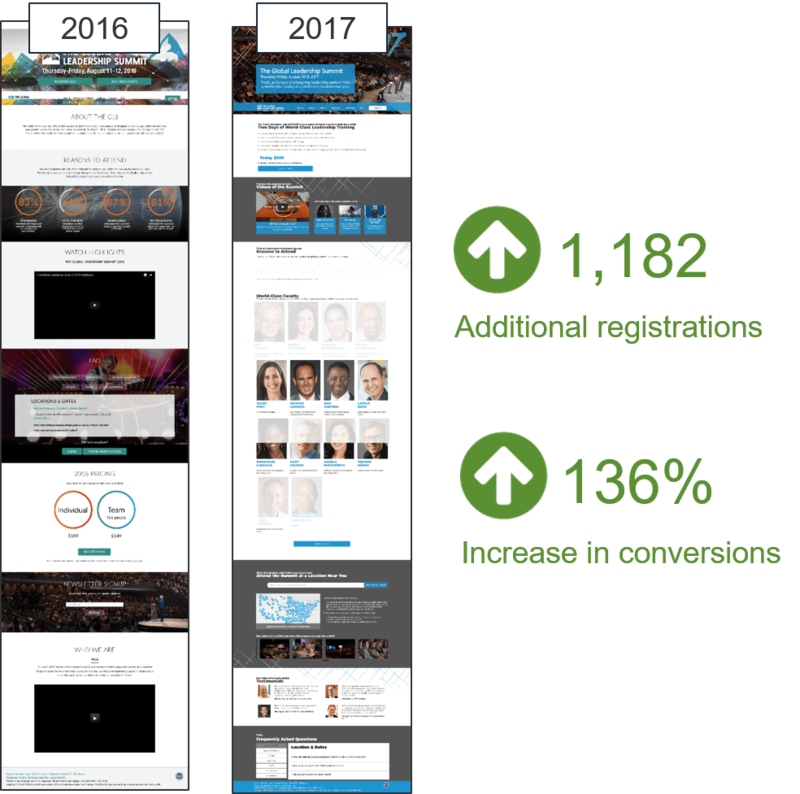 When The Global Leadership Summit team saw a significant decline in conversions from 2015 to 2016, they established a testing culture to understand the change. One of the hypotheses behind the decline was removing the incentive, but testing proved it was not the incentive that affected the decline; it was the value proposition. Their next step was to analyze the current webpage for gaps — where a prospect may not perceive the value they would receive by attending this event. The GLS team held a Value Proposition Workshop and applied their new learnings to their 2017 homepage for the summit — the results are worth sharing. To begin, let’s focus on the value delivery of the control. At first glance, the GLS team noticed that the page held very little perceived value in the headlines and the copy. The GLS team concluded that the headline “About the GLS” did not give enough value. 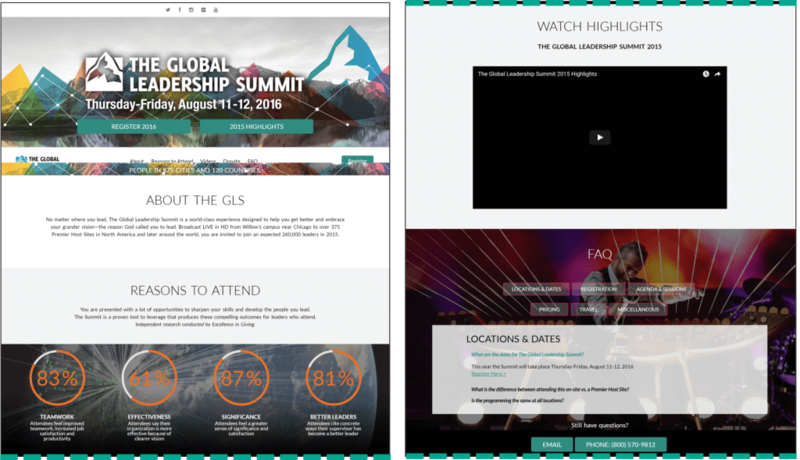 To a new prospect, who has never heard of The Global Leadership Summit, “GLS” might be a big jump. To assume that the prospect would understand this (or even need this information) is dangerous because it does not meet the prospect where they are in the thought sequence. As marketers, we need to ask ourselves: what is the sequential process in their minds as they enter this page? The prospect will probably ask questions more aligned to: How does this summit benefit me? What do I get out of it? Where is it located? Where do I have to travel? Who will be there? How can this improve my current career path? If marketers fail to ask the correct questions with the prospect in mind, we fail to find the correct answers. As we journey down the page, we finally come across some useful information for the prospect. There is value in the “Location and Dates” section because it answers these crucial questions the prospect might have: Where is it located? Where do I have to travel? Can this product help me? Answering these questions are great. However, its location on the page is not. What is it doing in the middle of the page? If the page fails to answer these critical questions in the first 4 inches, in combination with a prospect’s impatience, the conversion could be lost. The GLS team discovered this is a problem that needed to be addressed. And finally, after analyzing the entire page, there is absolutely no mention of the speakers in attendance. The GLS team observed that they were neglecting the other crucial questions prospects might have when entering this page, as aforementioned. Here is the new Global Leadership Summit page. The GLS team extracted the real value of the summit and transferred it to a homepage, only after attending the Value Proposition Workshop. Let’s see how the GLS team addressed the value perception gap. The GLS team added quantifiable claims in the headline … in the first 4 inches of the page. We can already see a stark difference in the headlines from 2016 and 2017. 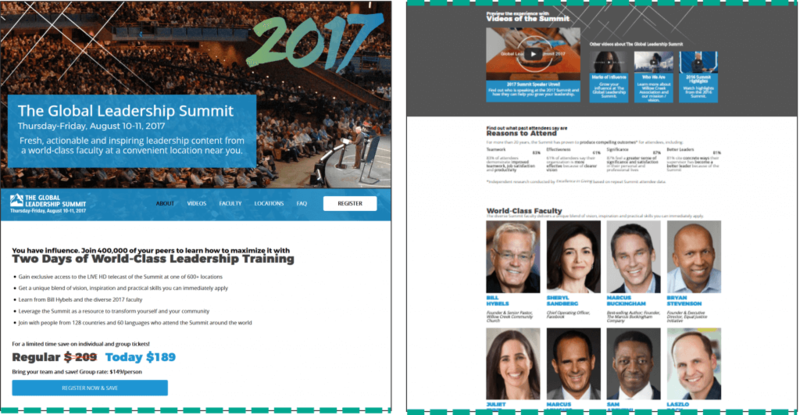 The larger headline reads “Two days of World Class Leadership Training,” and then goes back to read smaller text above the headline: “You have Influence. Join 400,000 of your peers to learn how to maximize it with …” The smaller text quantifies the number of people in attendance and popularity of the summit, while the larger text uses numbers to start showing instances of the Primary Value Proposition. This is an effective way to initially capture interest and build Credibility. This headline does not only hold credibility in the numbers, but there is also Specificity in the blue call-out box at the top of the page. The sub-headline under “The Global Leadership Summit” is specific about the location of the event, which erases the concern for travel arrangements (a potential pain point for prospects) thus, creating value. We will continue to see more of the same information elaborated further below, which creates congruence. And finally, they added value throughout the page. At MarketingExperiments, we call this Congruence. At the top of the page, there was copy that read “convenient location near you.” Although the “Location near you” section seems far from the top, the GLS team still alluded to this Primary Value Proposition in the main headline. Since this is the expanded section of the main Value Proposition, it creates congruence and reaffirms to the prospect that there is value. So, what does the GLS team get from building credibility and being specific? Not just a forceful Value Proposition, but more than double the conversions. As blunt as that may seem, the truth is the truth. People do not spend time delving into webpages or emails without knowing they are receiving something at the other end. Friends, marketers, do not waste your time replicating other webpages with their nonsense information, designs and vernacular; instead, test and use the prospect’s thought sequence. Ask the right questions to get the right answers. These tools will give you the results that you want for your company. And while you may not be ready to have an answer for your company as a whole or have the authority to craft that answer, you may still have one for the product, landing pages or marketing campaigns you manage. 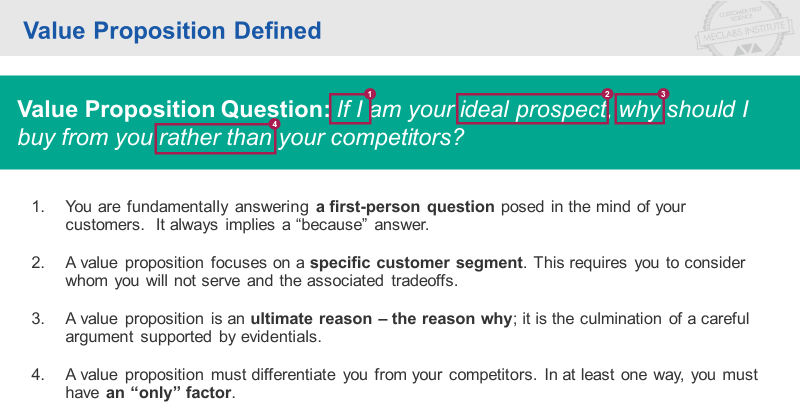 If your organization can’t answer the essential question above quickly and clearly for your ideal customers, your marketing is likely significantly underperforming. We’ve seen many organizations — previously confused about what their value proposition really is — achieve incredible results by simply tapping into this core truth about their company. By harnessing these powerful elements in their marketing, hundreds of organizations have achieved significant results. Your competitors may be doing a better job of communicating value — and taking business away from you. A strong value proposition seals the holes in your sales funnel and influences more people to say “yes” to your products and services. Our team will help you make a clear bridge between the theoretical power of a value proposition and practically apply it to your own sales and marketing process. Our value proposition workshops typically take up a full day of collaboration. Our facilitators dig in with your team and begin to uncover what about your organization makes your customers say “yes” throughout the span of the day. It will include a healthy internal debate with your key stakeholders to move out of internal, company-focused thinking and toward external, customer-focused action. Our facilitators are experienced at making sure all key voices are heard and bringing the group to an actionable consensus. It’s difficult to come back after a night of sleep and retain everything you learned the day before, so our trainers usually spend a few minutes in the morning to go over the highlights of the training the previous day. During this time, our trainers work directly with your team to draw out of them the essential claims your marketing organization can make to become appealing in a competitive marketplace. Once the claims have been discussed and recorded, each claim is then ranked by appeal and exclusivity. This process helps us prioritize the elements we should focus on in your marketing. It is not enough to make claims in your marketing; you’ll need to support them with facts and figures that lend credibility and clarity to those claims. This process enables your team to begin crafting a core messaging template that can be used across all your marketing. Understand exactly what it means to have a value proposition and why it is so critical to long-term competitive advantage. Provide a clear roadmap to optimizing and testing your value proposition through digital channels. MECLABS also provides a custom value proposition blueprint document to share with your team after the workshop for successful retention and shortening the onboarding process for new team members and your ecosystem of vendors and partners. If you’re interested in speaking to someone about how a value proposition workshop could help your team, simply fill out the form below, and we’ll get back to you within two business days.